We are officially one month into the new year, which marks the point when many abandon their resolutions. If you had a professional resolution that you don’t want to fall by the wayside, you’re going to need a plan. This is especially true for resolutions tied to what might seem like an overwhelming task. 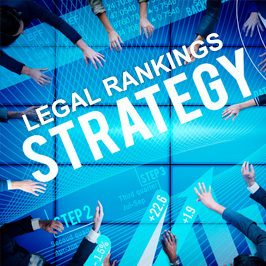 What is more daunting to a legal marketer than legal rankings? If you’re like many legal marketers, you’ve probably vowed to gain control over your law firm ranking selection and submission process. However, many challenges will arise to thwart your success in this arena, not the least of which is the sheer number of rankings to consider. Here are some practical tips to help you make good on your legal ranking resolution. Your best starting point is with the firm’s business development goals for the year. Is the firm focused on growing certain practice areas? Are you looking to increase the headcount in a particular practice area? These are a few of the questions to consider when developing a legal rankings plan. By analyzing these goals and comparing them to the available rankings, you will be able to zero in on what makes sense for your law firm. Internal business goals are as important as external ones. Did one practice group or attorney have an amazing year? Did the firm do some spectacular pro bono work, or develop and implement a diversity program? Then highlight it! With more than 1,200 legal rankings available, you can find the right opportunities to publicize these successes. Never underestimate the positive impact of being nominated. Even if the firm doesn’t win, the recognition a nomination provides is a powerful reinforcement. Let attorneys know that having their employer nominate them is a powerful stamp of approval. It’s a great motivator. Once you have researched and determined the rankings that are right for your firm, it is time to get buy-in. This is can be incredibly challenging and is a step that is often overlooked. You will need to defend the rankings you have selected and provide information to support the value. Understanding the submission process, methodology and time involved in crafting the submission will help with backing up your decisions. By taking the time to get the support of key decision-makers, it is much easier to say no to rankings that are brought to your attention throughout the year that don’t fit the plan. Even if you have your legal rankings strategy laid out for the year, there will always be surprises. Make a plan now to address rankings that are brought to your attention throughout the year. Resist the urge to say yes without first researching an award. Know what criteria you will use to evaluate the value of a ranking. Like all worthwhile goals, success in developing a rankings strategy may not be easy, but it is definitely worth the effort. Having a plan and sticking to it are key. At the end of the year, you will be able to look back and see how you tamed the legal rankings beast. If you have any questions regarding your legal rankings strategy or want help with organizing and preparing submissions, contact me, Susan Holmes, at sholmes@jaffepr.com.